CSIRO, the Commonwealth Scientific and Industrial Research Organisation of Australia, has been working with representatives of the NRC (National Research Council, Canada) and ASTRON (Netherlands Institute for Radio Astronomy) to undertake a collaborative measurement programme using three different receiver element designs known as PAFs as part of SKA pre-construction work. 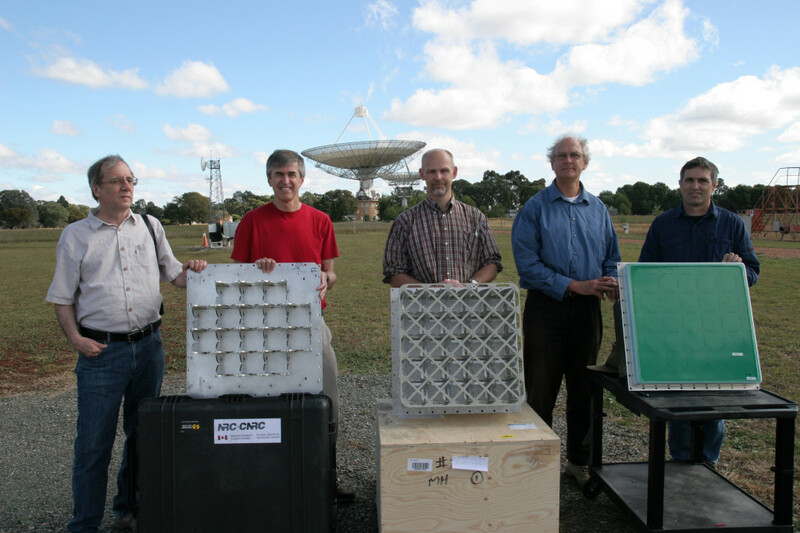 The phased array feed (PAF) demonstrators are being tested at CSIRO’s Parkes Observatory. The PAFs being tested are not full-sized arrays, but a representative array with which it is possible to emulate the performance of a full-size PAF. According to Dish Consortium lead Mark McKinnon, the aim of this activity is to test arrays which use examples of the various element technologies currently being considered for use in the SKA-Survey telescope, one of four instruments planned for the SKA. All three organisations are involved in various SKA consortia, announced by the SKA Organisation in 2013. This measurement programme is a key collaborative exercise bringing together expertise from CSIRO and NRC for the Dish Consortium and ASTRON for LFAA and MFAA (the low- and mid-frequency aperture array consortia). Further analysis will continue, taking into account factors such as technology readiness, maintainability, manufacturability, and manufacturing cost.